Bit of a flight of fancy, this one. About an artist I’ve written about before. Forgive me the indulgence: I didn’t have it in me tonight to write anything serious or weighty or that required research or fact checking. Back at the weekend. It all comes back to The Dolphins, really. It’s not typical of Fred Neil’s other work, it sounds like nothing else he ever recorded, yet whenever listened to, it feels like the puzzle box that would allow us to somehow solve Fred Neil, this most unknowable, enigmatic of musicians, this towering figure who made few records and then one day gave music up to work in the field he cared for most, the protection and preservation of dolphins. Fred Neil – aged 30 at the time he made The Dolphins, in 1966 – had moved sideways into folk-rock from the more traditional Greenwich folk-blues scene of which he’d been a part since 1961 or thereabouts, when he met and began singing with Vince Martin. Before that he’d been a very minor Brill Building writer, responsible for a couple of small hits for Buddy Holly (Come Back Baby) and Roy Orbison (Candy Man), and a few rockabilly-inflected pop sides he cut himself. Whether he’d genuinely been into first-wave rock’n’roll is not something I’ve ever been able to determine, but I tend to think he must have been. There’s a rhythmic emphasis in his guitar playing that sounds like it has roots in rock’n’roll, although he also hung out with jazz players and his knowledge of syncopation may have been derived in part from those associations. But rock’n’roll in the Chuck Berry sense had been replaced by Pat Boone, Frankie Avalon and Fabian in the early sixties, and no one with discernment wanted much to do with it. Folk-rock’s principle authors were fans of Bob Dylan and the Beatles, kids who mostly had been fans of rock’n’roll and had moved over to folk in search of meaning that Bobby Rydell couldn’t give them. Neil, older by almost a decade and something of a big brother figure to David Crosby, John Sebastian, and even Dylan up to a point, wasn’t touched musically by either. The Byrds’ version of folk-rock was derived from Dylan and The Beatles; as practised by the Mamas & the Papas and the Lovin’ Spoonful, folk-rock also took in vaudeville, Broadway tunes, light pop, jug band and country. Nothing that any of these bands produced has anything like the strange unknowability of The Dolphins. It begins with a heavily tremoloed electric guitar, haloed with echo. Instruments are hard panned, the stereo image is massive, the sense of space is vast. Neil’s voice reaches down to the ocean floor. Pete Childs’s guitar goes to the same raga-like outer space that Roger McGuinn tried to get to on Eight Miles High, the slashing rhythm guitar sounds oddly like Television, 10 years too early. It’s the most singular concoction, it’s sound as metaphor, it’s the best record Neil ever made, one of the best records ever made by anyone. If you’ve heard some other singer’s recording of The Dolphins, but not Neil’s oiginal, you’re in for such a treat. This entry was posted in Music and tagged 1960s, acoustic guitar, Baby Come Back, Bob Dylan, Brill Building, Broadway, Buddy Holly, Candy Man, David Crosby, Eigh Miles High, electric guitars, Fabian, folk revival, folk-blues, folk-rock, Frankie Avalon, Fred Neil, Greenwich Village, jazz, John Sebastian, jug band, Lovin' Spoonful, New York, Pat Boone, Pete Childs, rock'n'roll, Roger McGuinn, Roy Orbison, showtunes, Sound recording and reproduction, The Beatles, The Byrds, The Dolphins, The Lovin' Spoonful, The Mamas and the Papas, vaudeville on May 25, 2016 by rossjpalmer. The conventional narrative tells us that country-rock was the invention of Gram Parsons and his pre-Byrds outfit the International Submarine Band, and that their debut LP Safe at Home was the first country-rock album, finished in 1967 but not released until spring 1968 (by which time Parsons had joined the Byrds, featuring on their seminal Sweetheart of the Rodeo, contributing Hickory Wind and One Hundred Years From Now but having a far greater influence on the band’s sound than the songwriting credits and his limited number of lead vocals suggested). Of course, conventional narratives often leave out thorny little details. Stephen Stills has long argued that the Buffalo Springfield were the true pioneers in the melding of country and rock, and not without some justification. 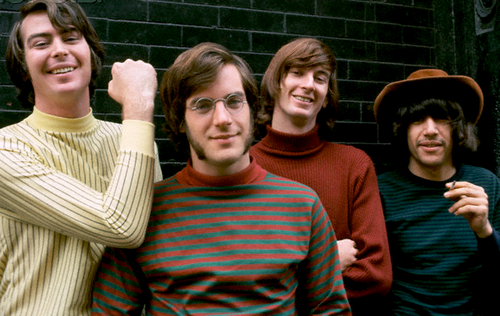 No one seems to speak up for the Lovin’ Spoonful’s efforts in this area, though. From the very beginning of their career in 1965, country music was a recurring strand in the band’s sound. Johnny Cash covered John Sebastian’s Darling Companion (from 1966’s Hums of the Lovin’ Spoonful, which was recorded a few months before the first Buffalo Springfield album) at his performance at San Quentin prison without changing a single note or inflection in the arrangement. Country licks bubbled up constantly in guitarist Zal Yanovsky’s playing, and Sebastian had a grounding in folk, blues and country that made its way into his original songs as well as influencing his choice of material to interpret. By the release of Never Goin’ Back, Sebastian had left the band and been replaced as lead singer by the group’s drummer Joe Butler. In addition to this, Yanovsky had been exiled for telling the police the name of his dealer after a marijuana bust (Yanovsky was a pariah in the whole music community for this transgression and he split for his native Canada as a result). In fact, the version of the band that cut Never Goin’ Back contained only Butler from the original line-up. If Darling Companion had been a rock and roll band playing a country song and doing it straight, Never Goin’ Back was a more artful combination of country and rock. The stabs of overdriven guitar from the second verse onwards (and the cowbell!) may signify rock music, but the song itself with its straight-outta-Nashville chord sequence, mournful acoustic guitar intro, its pedal steel its and lovelorn lyric is stone country. But it’s not hammy; there’s no theatrics here, and there’s no gimmicks. They’re not shooting for the same thing they did when they cut Darling Companion but the band’s collective love for country music – and their desire to play it straight – remained, and perhaps it’s because of this gimmick- and attitude-free approach to country material that they are still the key overlooked players in the evolution of country-rock. I’m not suggesting that the Spoonful did anything as fanciful as ‘invent country-rock’. Even if you do think that genre labels like that have validity, it’s always a simplification to lay that kind of achievement at the door of any one artist. Just having a quick think about it, country songs had always been a part of the Beatles’ repertoire, so they’ve got a prior claim, and I’m sure there are umpteen country records from the fifties that had something close to a straight-eights rock beat rather than a shuffle. Then there’s the Everly Brothers’ entire body of work. But credit should go where it’s due, and the guys in the Spoonful never seem to get a mention in this debate. In fact, they’re overdue for a reappraisal more generally. This entry was posted in Music and tagged country, country-rock, John Sebastian, Johnny Cash, rock, The Lovin' Spoonful on April 18, 2013 by rossjpalmer.